This is a stunning addition to any wedding or party. 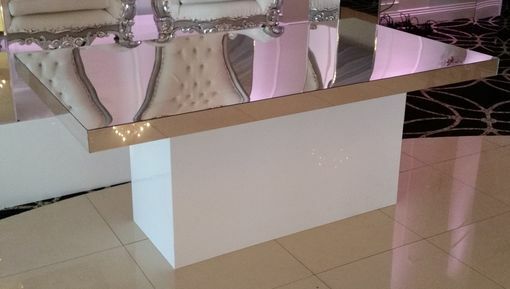 This design features a mirrored table top (standard size 72"L x 24"W) mounted on top of a white acrylic podium base. The top piece is 1/4" thick acrylic layered with an 1/8" mirror acrylic while the bottom is made of 3/8" thick white acrylic. Since all pieces are hand crafted and made to order, custom sizing and style is never a problem. 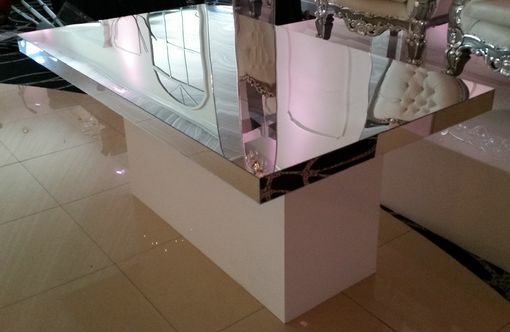 Want a clear base or a black base, no problem. 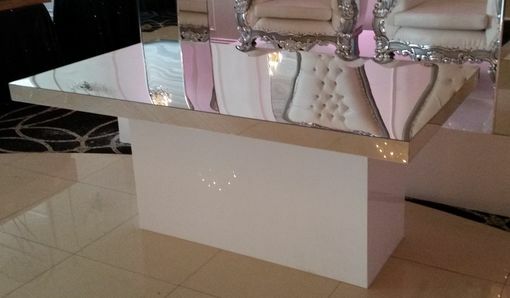 The mirror top even comes in different finish aside from clear, we have blue, pink, purple or brass, so let's create you the perfect look for your special day.